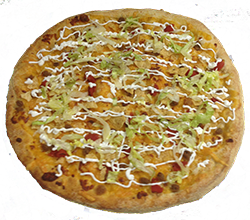 Taco Pizza - $12.00 : South Shore Pizza & Subs Apollo Beach Ruskin Sun City Wimauma, South Shore Pizza delivers the freshest, best tasting, pizza and sub sandwiches in South Shore pizza! This pizza tastes like a taco. It has that amazingly unique flavor you find in a taco. It's topped with ground beef, lettuce, tomato, and sour cream. Choose our spicy version to add Jalapeno's and hot sauce. Served in a large size only.